The Steel Detailer has an Automated Filing System that suits large model handling since most structural projects are considered large. The system comprises of four assembly levels maximum and deals with various models at different levels of the assembly tree. 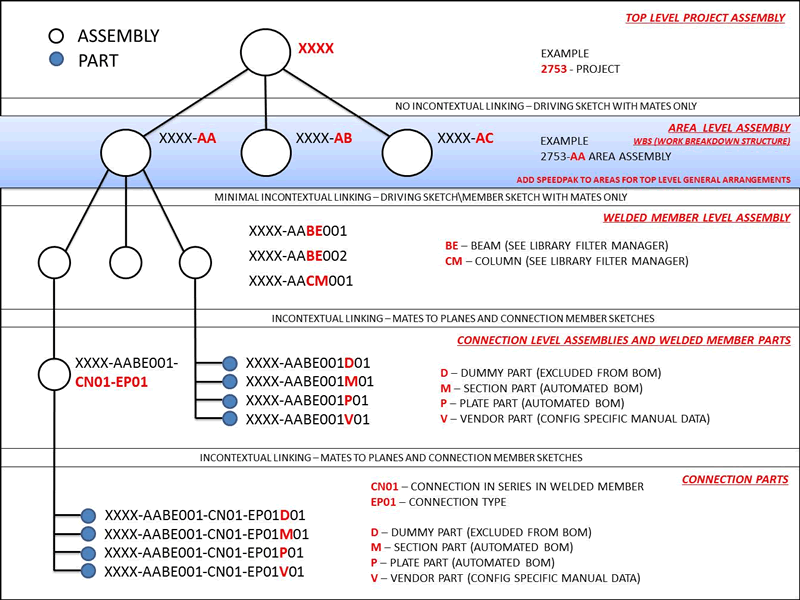 Connections being the last assembly level of the tree. All projects are broken down as show below. The Steel Detailer is not just a steel detailer! The library function of The Steel Detailer can be used for modelling concrete, vendor supplied equipment, piping, mechanical and electrical modelling. The filing system is setup to allow users of all industries to utilise the package. Instead of searching for models in previous projects or simply creating a windows explorer library, the steel detail adds functionality to find library models fast.